[dropcap]T[/dropcap]his may come as shock considering most data recovery companies brag about what they can recover (even if they really can’t). The market is flooded with these garbage Samsung MicroSD cards, they last three to six months and die. Why? They’re manufactured terribly, are sensitive to heat and pressure. We can’t recover the data because Samsung uses a cipher with a rotating key based on an LBA address that we can’t locate. There is no point contacting Samsung Korea, unless you like going around in circles. The second problem is identifying Samsung cards as they sell them in bulk and have random names silk screen on them. Here’s a quick guide for identifying them. If you see one PLEASE don’t send it to us. 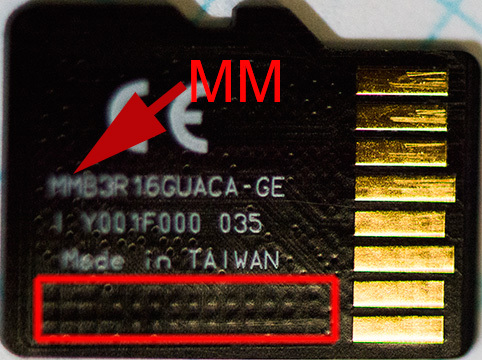 If you see a serial number starting with MM or if you can make out a faint grid of dots near the bottom of the card (they’re used to directly access the NAND memory chip) you’ve got a Samsung.